The Beacon Hill Playground will see some upgrades soon. Photo by Bridget Christian in the Beacon Hill Blog photo pool on Flickr. Improvements are coming soon to the Beacon Hill Playground, with $180,000 provided by the Parks and Green Spaces Levy. 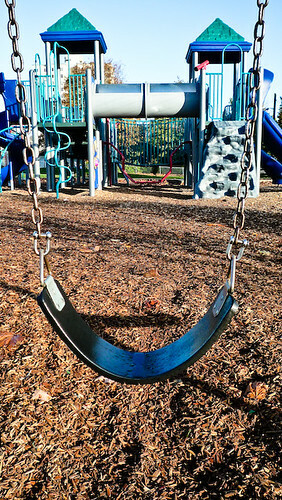 According to Seattle Parks’ project page, the plan is to provide access improvements and other site improvements, including bringing the play area into compliance with current play area safety standards. Neighbors are invited to an open house next month to discuss the project design. The meeting will be Tuesday, January 5, 6:30 – 8:00 pm, at Jefferson Community Center, 3801 Beacon Avenue South. For more information or to comment on the project, contact Kelly Davidson, 206-684-0998 or kelly.davidson@seattle.gov. Thanks to Shelly Bates for the heads-up! My thoughts on the Beacon Hill Playground are similar to Curtis’s (see below). Madrona Playfield is a great model. I also like the Lakewood Playfield. I’d definitely like to see more trees, especially ones that will get BIG, like oaks or elms. Considering the wading pool was closed all last summer, I’m wondering if its worth keeping, maybe some small scale skateboard features could be added to repurpose the pool. I also think the wall that holds the basketball hoop should be removed. I have admired the many very good murals that have been painted there, but they are always defaced with graffiti. I’d propose removing it and building a proper full sized basketball court – it would be more useable (the current surface is poor), and allow visibility through the park, especially from 13th. Lighting on all the sport surfaces (tennis court, basketball court, skate surface and soccer/baseball fields) would also be beneficial for two reasons 1) it would allow legitimate use of the park later into the evening and 2) increased legitimate activity and better lighting both deter crime, which is a serious, long-standing problem at the park. I’ll be sending my comments to Kelly Davidson, I hope you will too. I’d encourage you to mention problems or deficiencies, or ideas for how you’d like to see the park used, whether you have a solution or not. (What would be a good use of the building with the bathrooms, there is another room in it that could be used for something if it weren’t so nasty – think of Madrona Playfield with a similar building which is used as a Community Council meeting space and is available to rent for parties). It sounds like ADA access is going to be part of the project, which should include ramp access from 14th – something I would have appreciated when I was pushing a stroller. Thanks everyone for taking the time. make it feel like an urban oasis. It was closed so that new safety equipment could be installed. Theoretically it will be back next year. “As an element of the City’s water conservation effort, we’re encouraging people to use public wading pools rather than fill their home ‘kiddy pools’ or run backyard sprinklers. So, apparently there is some public benefit to providing a wading pool (besides the obvious benefit of providing recreation space, that is). Let’s lobby to keep the wading pool! The wading pool is a good way for parents to meet one another and fosters a sense of community which we need to support.I agree that the basketball area could use revisions, but please not at the expense of the wading pool.